This Berkeley remodel, winner of Berkeley Architectural Heritage Association’s Preservation Award for Restoration and Renovation, preserves the original character of the 1914 Purcell and Elmslie home, while updating its structure and adding appropriate and seamless features to accommodate contemporary living. One new feature was the addition of a reading nook, located off of the stairway. Extending from a large stair landing, its intimate scale and warm wooden interior invite one to linger, giving pause in an otherwise transitional space. 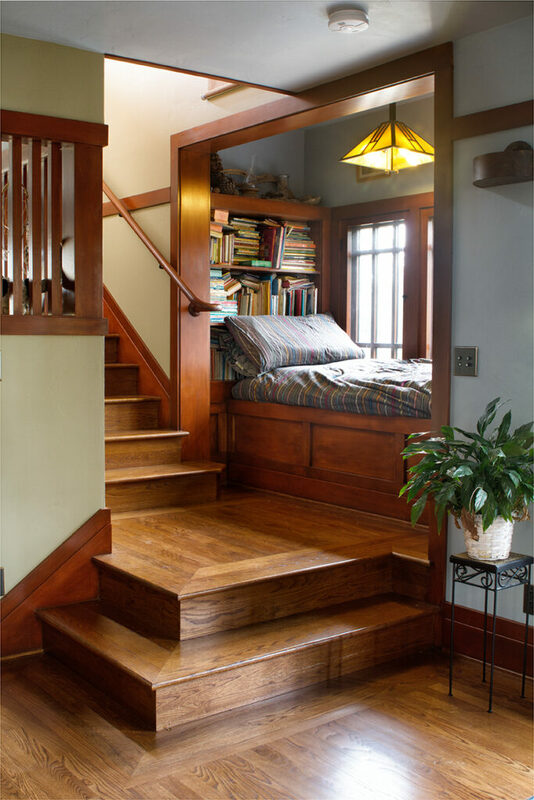 The raised platform inside fits a twin bed, making the space suitable for house guests. Ample bookshelves encourage browsing, and westward facing windows along the back wall let in afternoon light, providing views of the Bay. This combination of attributes makes for a truly multi-use and delightfully cozy space.